Materials in the Richard Petty Collection are housed in the Closed Collection of Special Collections. If you wish to view item in the Petty Collection, it is best to make an appointment by emailing or calling ahead (spcoll@appstate.edu, 828-262-7974). For hours and other information about using items in the Closed Collection, go to the Special Collections Research Services Page. 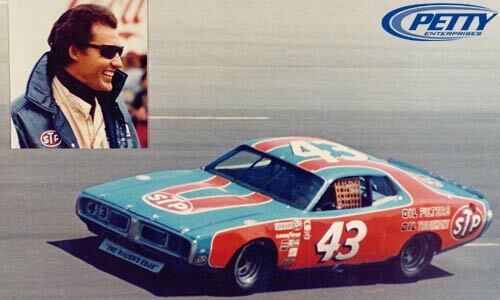 The first superstar of stock car racing, Richard Petty is the most successful driver in NASCAR history. During his long driving career (1958-1992), he won seven NASCAR championships and set several driving records that may never be equaled: the most wins, 200; the most wins in a single season, 27 in 1967; and the most wins in a row, 10 in 1967. In 1,185 starts he finished in the top ten 712 times. He was the first stock car racer to win a million dollars in one season (1971). Known affectionately as "the King," Petty won the Most Popular Driver award nine times. He was a member of the first induction class into the NASCAR Hall of Fame in 2010. Young Richard Petty helped his father in the garage from an early age. He began sweeping the floor and changing the oil, eventually graduating to rebuilding cars. He and his brother Maurice (pronounced Morris) worked on Lee’s pit crew as teenagers. His father finally let him get behind the wheel of a race car when he turned 21. In his driving debut on July 12, 1958, he competed in a convertible race at Columbia (SC) Speedway, a half-mile dirt track. He qualified thirteenth and finished sixth. He notched his first win at the same track on July 18, 1959. Lee never showed favoritism to his son on the track. Petty’s first NASCAR Grand National (now Nextel Cup) race was at Canadian National Exposition Speedway in Toronto on July 19, 1958. He drove well, but was bumped out of the way by his father, who went on to win the race. In a race at Lakewood (GA) Speedway on June 14, 1959, Lee protested what would have been his son’s first Grand National victory and was subsequently declared the winner. Petty won the Rookie of the Year title in 1959 and secured his first Grand National victory at the half-mile Charlotte (NC) Fairgrounds dirt track on February 28, 1960. 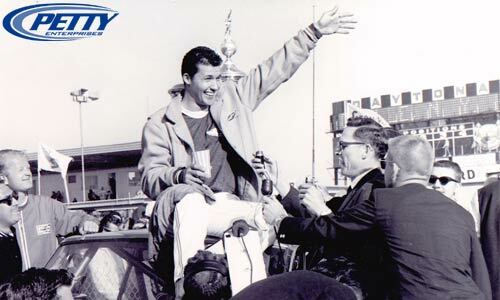 In February 1964 he won the first of seven Daytona 500s. His most successful season was 1967, when he won 27 of 49 races. Petty drove mostly Chrysler cars during his career, but also piloted Fords and General Motors autos for brief periods. When Chrysler withdrew its factory support of NASCAR in 1965 because its Hemi engine was ruled illegal, he went drag racing in a Petty blue dragster with “43/jr” and “Outlawed” painted on the doors. At a small drag strip near Dallas, GA, a mechanical failure sent his car into an embankment and over a fence into the crowd. Six people were injured and an eight-year-old boy was killed. Faced with sagging ticket sales, NASCAR reinstated Chrysler in 1966. Petty has been involved in many wrecks. His worst crash occurred on May 9, 1970, in the Rebel 400 at Darlington Raceway, when his car hit the wall and flipped upside down. His injuries included a broken shoulder sustained when his arm flopped out of the window during the wreck. As a result he helped develop the window net, which keeps the driver’s head and arm inside the car. The constant stress led to an off-season operation in 1978 and removal of 40 percent of an ulcerated stomach. He has lost 75 percent of his hearing from a lifetime around roaring engines. Petty Enterprises continued to do things the traditional way, and by the early 1980s was not as competitive as it had once been. In 1984 Petty left the family operation to race for Curb Motorsports. He notched his landmark 200th victory at Daytona on July 4, 1984. The occasion was highlighted by a visit from President Ronald Reagan, the first time a president had attended a NASCAR race. Petty returned to Petty Enterprises in 1986. Petty’s last racing season was 1992, and it was celebrated with the Fan Appreciation Tour, a year-long outpouring of love and admiration from the fans for their favorite driver. Since his retirement from driving, Petty has remained involved in racing. For many years he fielded teams in NASCAR's three top series under the Petty Enterprises banner. Currently he is active in Richard Petty Motorsports. The team fields two cars in NASCAR’s Nextel Cup Series, Petty also does many personal appearances and product promotions. Petty is renowned for his rapport with both fans and the media. Known affectionately as “The King,” he won the Most Popular Driver award nine times. Tall and lanky (6'2", 180 lb. ), with a ready smile and trademark cowboy hat, boots, and sunglasses, the star who married his hometown sweetheart (Lynda Owens Petty), exemplifies the accessible, humble, family-oriented driver image that NASCAR promotes. He was often the last driver to leave the track, talking with and autographing items for fans for hours. Former NBA star Brad Daugherty wore number 43 in honor of Petty. As a small boy attending a race Daugherty spied the driver a distance away on the other side of a fence. He called, “Mr. Petty! Mr. Petty!” and Petty took the time to walk over and talk to him. The Petty blue number 43 car is instantly recognizable. The number forty-three was chosen because it was next to Lee’s number 42. When he was preparing the car for his first race in 1958, Petty mixed a gallon of white and a gallon of blue to paint the car, and the famous Petty blue was born. The red component of the Petty blue car was added when STP became a sponsor for Petty Enterprises in 1972. His fans often sported “Petty for President” bumper stickers. In 1996 some of them got the chance to show their support for their hero in a real election when Petty ran an unsuccessful campaign as the Republication candidate for the North Carolina Secretary of State. Petty was inducted into the North Carolina Athletic Hall of Fame, the North Carolina Auto Racing Hall of Fame, and the International Motorsports Hall of Fame. He is a four time recipient of the Myers Brothers Award, given by the National Motorsports Press Association for significant contributions to the sport, and was named the 1995 Auto Racing Writers & Broadcasters Association Man of the Year for contributions on and off the track. He was awarded the Medal of Freedom, the country’s highest civilian award, by President Bush in 1992. The number 43 car is enshrined in the Smithsonian Institution in Washington, DC, as an historic relic. Petty has appeared as himself in a number of movies, including a 1972 film biography 43: The Richard Petty Story. The family maintains the Richard Petty Museum in Randleman, NC. Lynda Petty, Richard's high school sweetheart, died in 2014 after a long battle with cancer. Petty continues to live on the family acres in Level Cross, NC. Lynda Petty, wife of stock car racing legend Richard Petty, donated a large collection of materials documenting her husband's career to the Stock Car Racing Collection at Appalachian State University in 2005. The gift, which covers the years 1958-2003, includes newspaper and magazine articles, fan letters, scrapbooks, promotional materials, awards of recognition, business correspondence, photographs, books, race programs, and more. Ms. Petty said, "These memories of Richard's career are important to the family, and we are glad we can entrust them to to the Stock Car Racing Collection at Appalachian State University for preservation." The Richard Petty Collection came to Appalachian State with the help of motorsports journalist and public relations expert Deb Williams, who is a member of the Stock Car Racing Collection Advisory Committee. Williams, a close friend of the Petty family, put Lynda Petty and Collection curator Suzanne Wise in contact with each other. Wise noted, "The Petty collection is a wonderful resource for stock car racing scholars. It traces the career of the most popular and successful driver ever in the sport, and offers a peek into his life away from the track. Richard has been very active in charitable activities, and even ventured into the political arena. We are delighted to organized and preserve these materials for future generations."